JIMS organized a Guest Lecture on 10th March 2016, for BBA 1st year students. The topic of the session was “Concept, Perception and Politics” i.e. understanding CPP of Management. 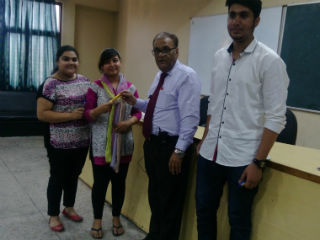 JIMS organized Guest Lecture by Professor Subhash Chand Kapoor, who holds an honours degree in English Literature with a post graduate degree in Behavioural science with specialization in Personnel Management and Industrial Relations from the University of Delhi. He also holds a Diploma in Training and development from ISTD and Diploma in Personnel management and Labour Law from the Indian Law Institute, New Delhi. He has over 34 years of experience at the Corporate, consulting and innovative mix of academics. Subhash Kapoor is presently associated with Third Millennium Business Resource Associates Private Limited as Executive Director. He has been involved in providing consulting in major management areas of Human Resource and Industrial Relations with special focus on HRD including Human Resource Policies, Recruitment and Selection, Training and Development, Appraisal Systems, Compensation and Benefits, Attitude, Morale and Motivational studies, etc. He shared information regarding the corporate culture by showing the gist of corporate culture movie. He also explained students about the unity of group work with the help of various practical games with their classmates. He also discussed about functioning of corporate culture and how things work. He entertained the questions of students and also discussed examples and helped the students to acquire knowledge with the help of case studies through which they co-relate their Career/future dreams after pursuing BBA program. 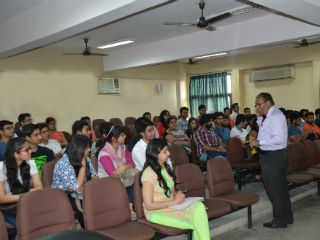 The session was interactive, learning and helped students to enhance their knowledge regarding Cooperate Management. Mr. Kapoor provides platform to the students where they discuss about their fears, shortfalls, etc.